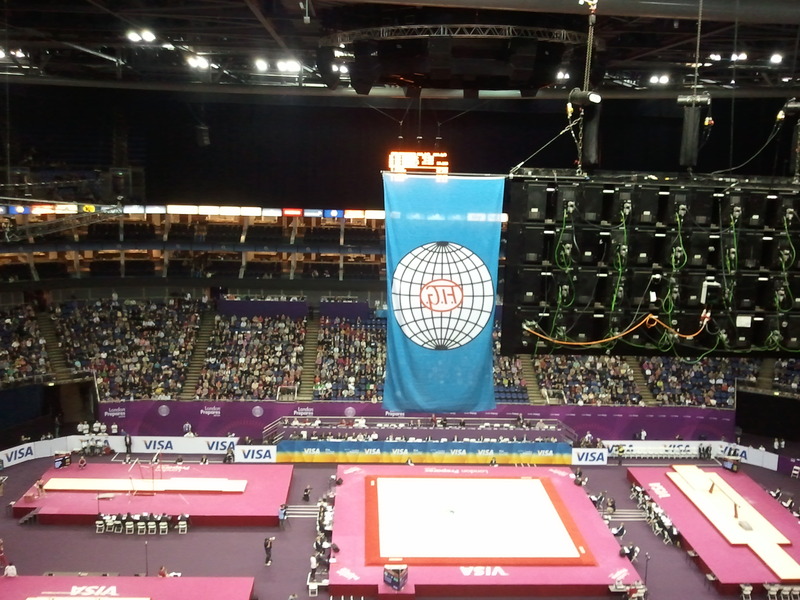 The O2 prepares – gymtastic! 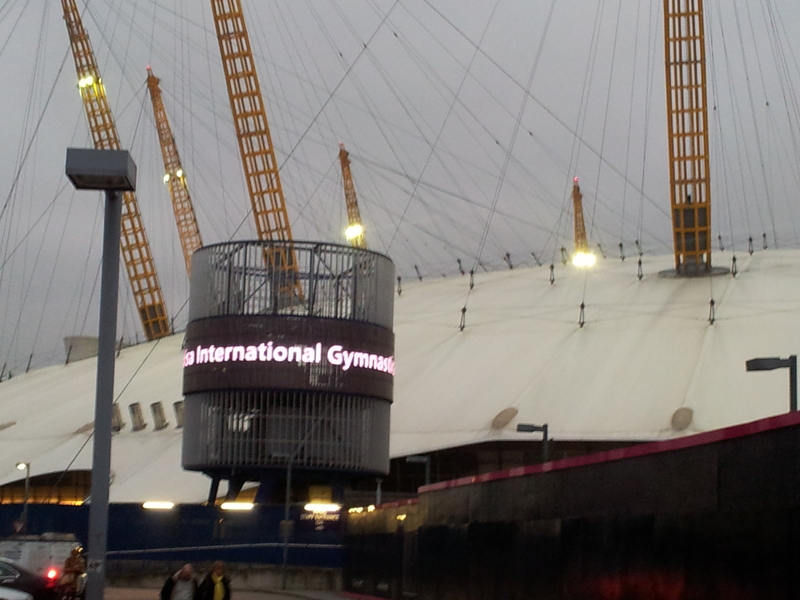 Last night was the Visa International Gymnastics in the North Greenwich Arena. The crowd was generally female and very young. One little girl had a t-shirt with a warning “gymnast in training – may flip at any time”. We found this to be the case, particularly among the Brazilian team in warm-up. Such focus and enthusiasm was hard not to salute – they all danced along to the music when their star competitor was performing her truly impressive routine on the floor. Then, when they were waiting their turn on the apparatus, they found white lines on the floor (a bit like cracks on the pavements) to throw a back flip on an imaginary balance beam. That’s what you do if you’re a gymnast with time on your hands. I went with two former athletes. Despite some reservations about whether this was, in fact, a sport, we all got into it. It took me a significant amount of time getting used to the multiple visual input sources – gymnast in the middle on the floor; gymnast in the front on the vault; gymnast on the right on the beam; gymnast on the left on the uneven bars. Apparently they are called uneven now, but I’m sure it used to be asymmetric. What happened there? The scoring system presented some issues also. There was a team competition – the top 4 got Olympic qualification – but there were also teams made up of individuals with an array of national affiliations. They were in an individual competition, I think. So, despite the consensus that it wasn’t track and field, the tension of Brazil’s determination to make it into the Olympic qualifying group ended up making it a real sporting experience. It all came down to the final apparatus, the beam. This event was the last chance to qualify for the Olympics, and only the top four got through. Brazil were neck and neck with Belgium to make it into fourth place. After two falls from a team-mate, the final gymnast pulled it off. When the results appeared, the Brazilian team were ecstatic – shouting and jumping and hugging each other. It was thrilling to watch. It seemed, however, that almost everyone in the audience was focused on the floor routines that, literally, took centre stage, especially when a British gymnast performed. Then, the crowd clapped every little thing she did. It was a bit like watching David Beckham at an England international at Wembley – placing a toe on the field was enough to make everyone explode into mad applause. This is an indicator of the Olympics Effect to come … we are going to be clapping anyone British doing anything, anywhere. 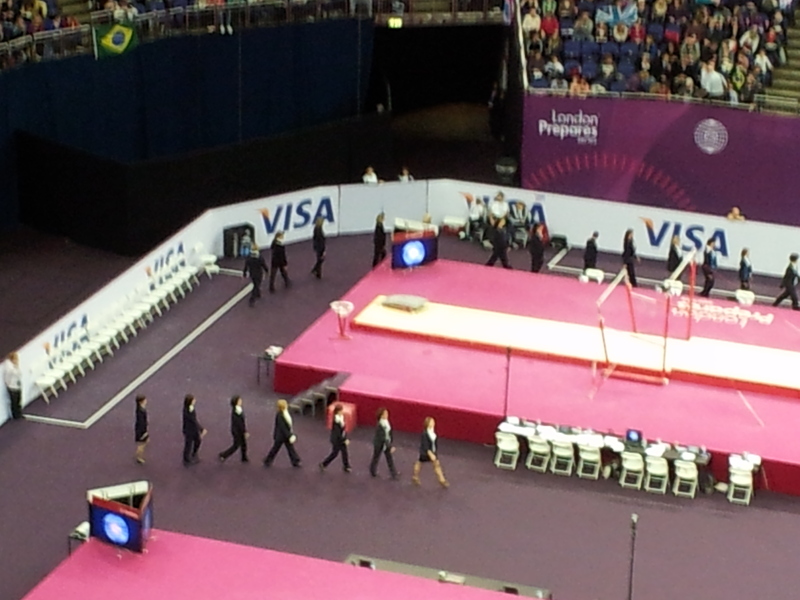 One of the best bits about the gymnastics was the march. This is something that could easily be usually incorporated into other sports. When the teams changed apparatus (the rotation) the announcer commanded that the competitors parade in a line to the accompaniment of banging house music. Everyone clapped in time. Everyone except my two companions, that is.